Seagoing cowboys at the Kalona (IA) Mennonite Church, May 3, 2016. 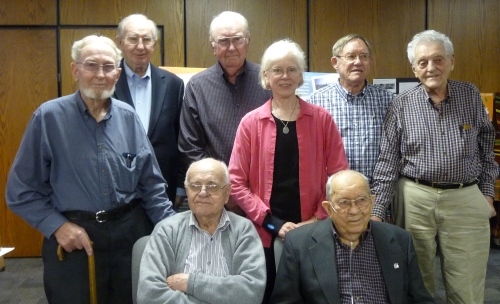 Left to right, seated: Emil Ropp, Henry Mullett; standing: Levi Miller, Charles Silliman, Weldon Beach, Peggy Reiff Miller, Paul Walther, Wallace Fisher. Photo credit: Mary Lou Farmer.